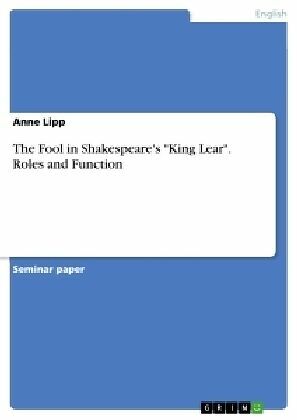 Seminar paper from the year 2013 in the subject English Language and Literature Studies - Literature, grade: 2,0, University of Potsdam (Anglistik/Amerikanistik), language: English, abstract: Throughout history the traditional function of the fool in a royal household was to entertain the members of the court by being an imbecile and a jester. In "King Lear" Shakespeare allows his Fool to take over the unique position of the person who is able to correct his master without being punished. Nevertheless, the Fool does not seem to have any direct influence on the behavior of the king, as he is not taken seriously. The aim of this paper is to present the various roles of the Fool and to analyze his function within the play. Throughout the play the Fool takes over the role of the person who constantly reminds Lear of his mistakes in order to enlighten him and make him realize his folly. He first appears in the middle of Act I Scene IV of the play and immediately points out that Lear has made a mistake by dividing his kingdom among his daughters. When talking to Kent he says: [...] if thou follow him [King Lear] thou must needs wear my coxcomb. How now, Nuncle! Would I had two coxcombs and two daughters! (King Lear, Act I, sc. iv, l. 109-111) In this scene the Fool is offering his coxcomb to Kent. By referring to his cap as a coxcomb , he uses the ambiguous meaning of this word in order to suggest the king to be the fool rather than himself. Kent before him had criticized Lear for his decision causing him to be banished from the kingdom, however, the Fool receives no such punishment showing that he can get away with actions that are far more courageous.